Have you heard the one about the MiXeD uP sUbJeCt LiNe ThAt WaS wRiTtEn LiKe ThIs? What about the email that was packed full of conflicting calls to action? Or maybe the one about the slightly inappropriate subject line –with a swear word directed at the lucky recipients themselves? It’s safe to say that when it comes to email campaigns –we’ve all made our share of mistakes. Email marketing isn’t the easiest thing in the world, and even pro marketers get it wrong sometimes. But one area where you won’t want to mess around when it comes to email campaigns is the time and day that you’re sending your emails out. The reason is simple: the time and day can make or break your campaign’s success. When you send your email will make a world of difference in terms of how likely it is to be opened, and read. As we all know, the most important metric when it comes to measuring the success of your email campaign –aside from your open rate, is your click-through rate (CTR). The time that you send your email will impact both of those things. 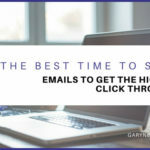 With this in mind let’s look at how you can find the optimal time for sending out your emails. But before we do, let’s have a quick look at some of the key components of a successful email campaign. When you put together a puzzle, you need every piece to make it work. Usually, we’ll look at a picture of the completed puzzle and then visualize the finished version as we put it all together. When it comes to email campaigns, they can be viewed in much the same way. You look at a picture of the completed version; say, an order placed and an invoice generated. But if you miss one piece, a sale may never transpire. Having the right list – If the audience isn’t right, your efforts will be wasted. Being clear on the purpose of the email – Is it a newsletter, promotion, product launch, warming up the list, etc.? Having realistic goals – In most cases, you can’t expect a new prospect to convert based on an email alone. Instead, a better goal would be to develop relationships or encourage the prospect to learn more. One more key piece of the puzzle is something that’s often overlooked, yet vitally important: sending the email at the best time. Timing is a crucial component in ensuring that your emails get opened –and read. 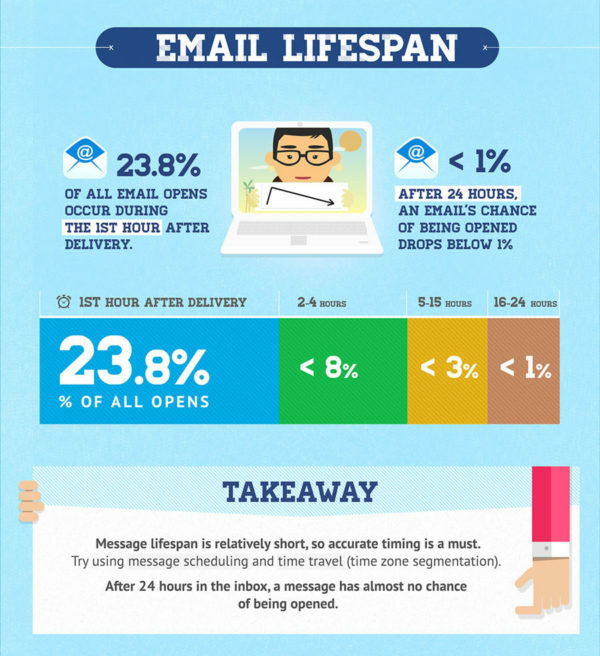 Consider for a minute, that 23% of all email opens happen within the first hour after delivery. After 24 hours, an email’s chance of being opened drops to below 1%! 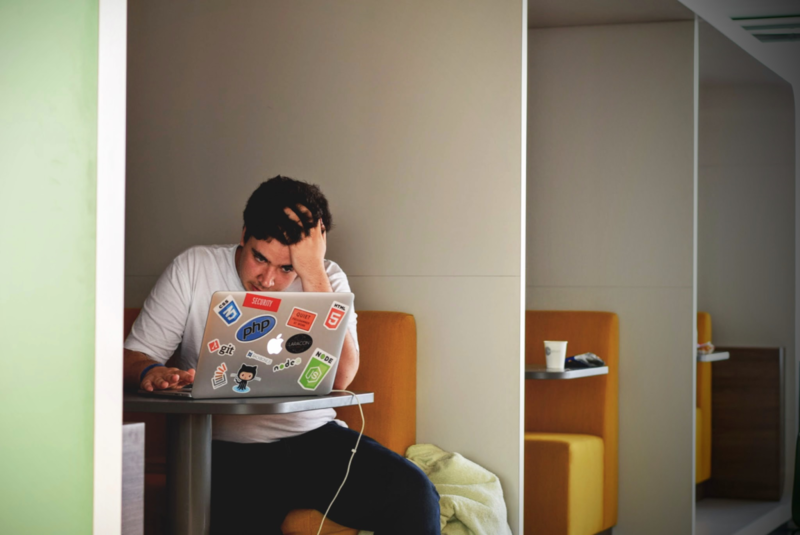 Obviously, you’ll want to send your emails out when your prospects aren’t too busy or otherwise distracted, resulting in your emails being buried or sent to the delete box. 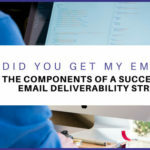 If your email hits an inbox when it’s flooded or while the recipient’s busy, then there’s a very good chance that your email will end up neglected, ignored, and never opened at all. When it comes to sending emails, it’s safe to say that timing is everything. 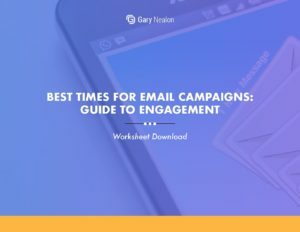 Get our Best Times for Email Campaigns Worksheet delivered right to your inbox. We’ve seen the importance of getting the right times when sending your emails. This begs the question: which times are best? The fact is that different studies have shown different times. The big answer is: it depends on your target audience! The simple answer, though, is that a number of studies point to Tuesday at 10:00 am as being one of the best times to send emails. It makes sense when you think about it. Monday’s usually busy, and people are focused on clearing out their inboxes. By Tuesday, things have calmed down just a bit; increasing the chances of your email getting read. Tuesday is regarded as the number one best day for sending emails according to CoSchedule’s analysis. Thursday is a good day if you’re sending two emails a week. No single study showed that Wednesday was the most popular, however it did come in second place several times. 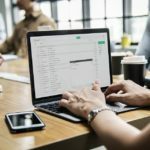 According to a study by MailChimp, which included all the compiled data from several billion email addresses, the best day of the week to send emails was on Thursday, but by a very small margin. Their study found that overall there was actually very little difference between any of the weekdays, Monday through Friday. However, they found that the weekend was the least optimal day; with Sunday being the worst day for sending emails. But while this data gives you a great place to start, you’ll still want to do some research and testing on your own email list, to see which times generate the best response rate. Here’s a look at a few tips to help you discover what times and days your audience will be most receptive. 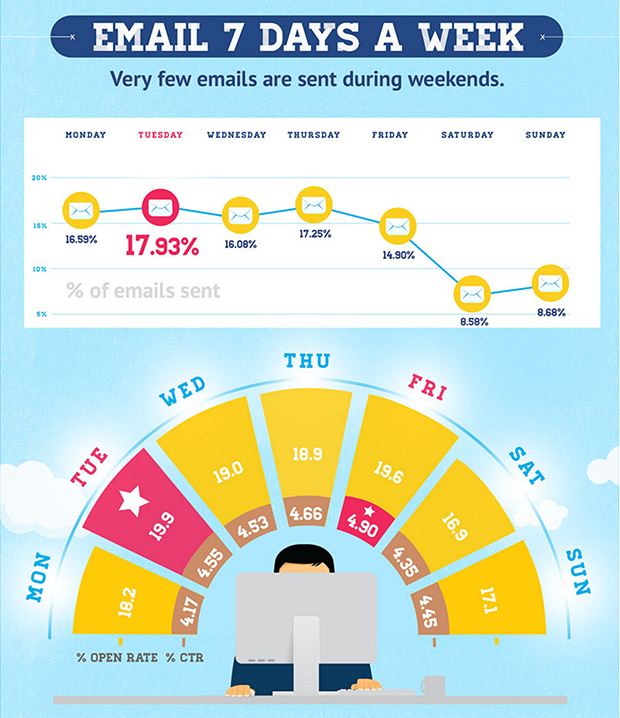 Constant Contact put together a great chart that shows the best time to send emails per industry. Time zones will also play a role in the open times. Consider what time zone your typical customer is in, and target that one. Or, if you’d like to target different time zones and you want to be savvy, segment your list into time zones and send them all at the same time in each time zone. Some email service providers have this feature in place. Otherwise, you could focus on (EST) since that’s where almost half the nation’s population is. Many studies agree that Tuesday midmorning is the best time to send an email. As soon as someone subscribes, send them an intro email. You can also find an optimal time to send emails by posting a Facebook ad. Track when you’re getting the highest response rate, and try sending an email to your audience at the same time. Every audience and audience segment will vary. Generally speaking, email click-through rates are terrible, and open rates aren’t good either. But since email marketing has the potential to deliver a 38x return on every dollar spent, it’s worth spending some time to get it right. Email marketing can be an extremely valuable strategy; but only if it’s backed by a solid campaign that’s executed properly. 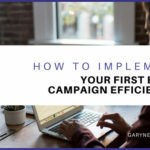 One of the easiest ways to measure the results of your campaigns is by using a tool like MailChimp to A/B test the success of emails that are sent at different times. Neil Patel, ‎marketing expert and founder of ‎Crazy Egg, outlines the step by step process for using Mail Chimp to track your campaign. Head over to MailChimp and log into to your dashboard. Select the list you’d like to test. Split the quantity at 50/50 and select 8 hours for the data. Now, choose two different times to send the test emails. Neil Patel recommends Tuesday at 10 a.m. and Thursday at 8 p.m. Enter your two times into your test, making sure they line up with your typical customer’s time zone. Make sure your email content’s ready, and you’re good to go. To capitalize on your send times, after each campaign take a look at your data to see what times work the best. Depending on the size of your list you may also want to monitor results as the campaign is running to see if you need to make adjustments for future emails. Look for days and times that have the highest open rates, click-throughs, conversions, and sales. These metrics will help you to determine your new ideal send time. How long they have been subscribed for. Are they a current customer or one that is still in the funnel? Check your sales data. If you have data on website sales, consider sending your marketing emails just before you tend to experience the highest uptick in sales. Is there a particular segment that is not opening their emails, or is a measurable number of them opening at a different time? If you are getting a low open rate, are there other factors that may be hindering the open rate such as targeting the wrong audience or a weak subject line? If you are subscribed to a competitor’s mailing list you could analyze what time you are receiving their emails. Is there a succinct pattern to their send times? Keep in mind that, again, the best send times will vary depending on industry. 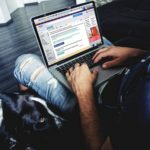 The best email strategies are an ongoing process –when it comes to testing your email responses, this is certainly true. Take these things into consideration as you learn from the data you are analyzing. Have the next follow-up email or next campaign ready to go so that the time that got the best results can be implemented right away. When looking at the best send time, make sure you are looking at the best time for individual audience segments. What works best for current customers may not be the same as it is for customers you are trying to acquire. Always include an unsubscribe button at the bottom of your emails to make it easy for anyone who wants to opt out to do so. 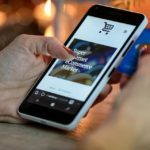 You might consider putting social media buttons on your unsubscribe page, to give your un-subscribers one more chance to connect with you. Run subsequent tests to see what else you can do to increase engagement. Try adjusting the subject line, subheader, images, call to actions, and content. Effective email marketing is a science. The more data you gather from individual campaigns, the better equipped you will be to find the “sweet spot” for sending emails for that particular campaign. To recap: the send time is one piece to the puzzle, and it’s one that’s vitally important. If your audience is busy or otherwise engaged when you send out the email, you risk losing it to an overflowing inbox and ultimately the delete box. Sending it out at the right time is key to getting your message noticed, and read. At the end of the day, if you still don’t know when your audience is going to open your email and aren’t sure where to start, just pick a time that you feel will work best –or determine to do it at 10:00 am (EST) Tuesday, then send it to half of the subscribers on your list. Then, see what your response rate is. Then, try a different time; maybe Thursday at 10:00 am, then send the same email to the remaining half of your subscribers. The more campaigns that you run, and the more you analyze data from each campaign, the more precise your timing will be.